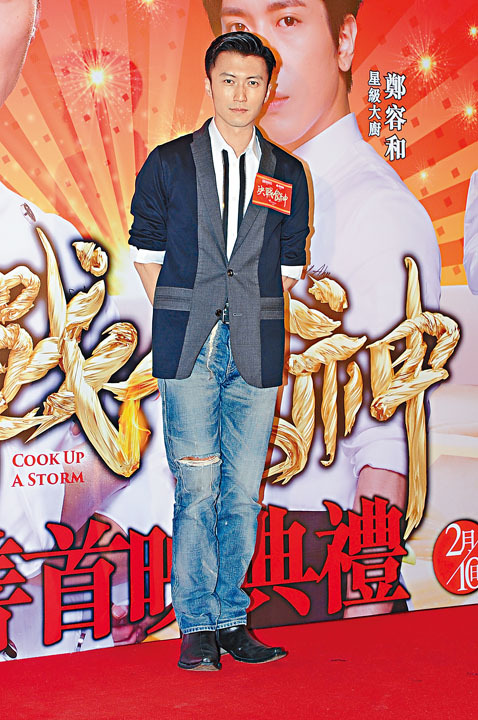 Nicholas Tse Ting Fung, Korean star Jung Yong-Hwa and Michelle Wai Sze Nga two nights ago attended their film COOK UP A STORM (KUET JIN SIK SUN) charity premiere at Causeway Bay. Emperor boss Albert Yeung Sau Sing, executive producer Mani Fok Man Hei, producer Manfred Wong (Man Jun) and director Raymond Yip Wai Man promoted the film. A five minute confidential video was shown. To celebrate the Lunar New Year in advanced, actors and guests performed a "Lo Hei" ceremony! When Jung Yong-Hwa appeared, he greeted everyone in Cantonese. "Hi everyone, I am Jung Yong-Hwa". Fans screamed all over. Ting Fung also wished everyone an early Happy New Year and said that eating was the most important. I wished that everyone would get to eat. On the stage Ting Fung also fed Jung Yong-Hwa Hong Kong snacks like eggettes and fish balls. Jung Yong-Hwa praised in Putonghua after tasting, "Very delicious!" 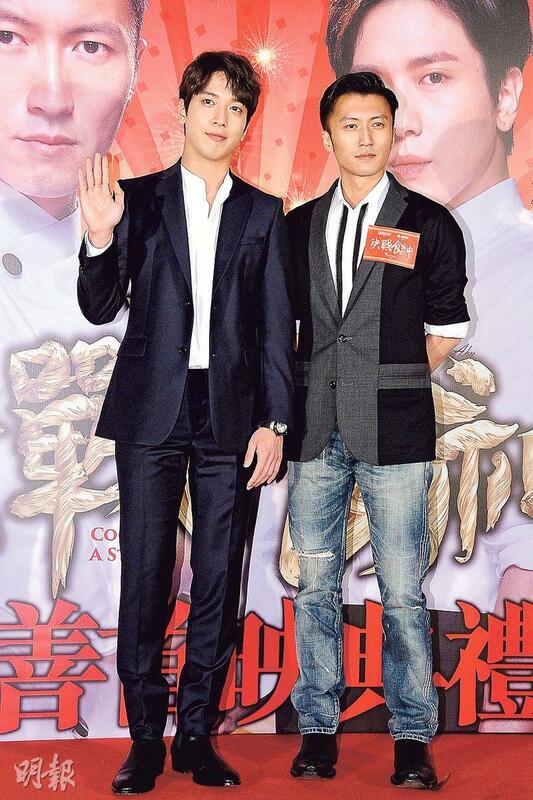 Ting Fung praised Jung Yong-Hwa as a professional actor. The first he met him, he saw how he cut cucumbers in the kitchen and knew that he trained hard before. Jung Yong-Hwa revealed that during practice he cut himself, because on camera the hardest part was to perform his expertise on cooking. He also said that aside from Ting Fung's apple pie, he also tried roast pork. If one day Ting Fung would open a restaurant, he would definitely visit everyday. Ting Fung was asked if he would consider opening a restaurant. He stated that he has not thought about it. "With my personality I would keep my eye on the food 24 hours a day. The boss would complain about my lack of music and movies. Now instead I am pretty free, when I have time I would be a cuisine consultant or guest chef. Instead I have even more space. I am trying to merge food with film and television, for example my cookie making, CHEF NIC is already in its third season, and this film. The Chef Nic brand is starting to mature, I want to use a different style to keep it going." Speaking of rumors that his father Patrick Tse Yin becoming a father again, Ting Fung said, "I heard about it, it's funny! I didn't ask him, I told my sister to. He sent me a few foul language replies like you are X crazy! (So humorous?) Are you calling me or the person who passed the message humorous? (What was your reaction?) Just like what he told me." Jung Yong-Hwa said that after first taking the role he began practicing cutting. He practiced for four to five months but he did not study with anyone. He only relied on chef videos. He was not injured until later in the shoot when he got a little careless. Jung Yong-Hwa also said that he would not care whether his future girlfriend or wife would be able to cook, since he would be able to cook for her too. Wai Sze Nga revealed that she gained five pounds during the shoot. "In the film I had to pretend to taste, but often after the camera stopped rolling I still put the food in my mouth. Sometimes Ting Fung would cook and I would finish before leaving work." She said that she asked Ting Fung about how to make salt water chicken wings. "I want to cook it for my boyfriend, but after he had it we broke up. Maybe I missed something and added a little more salt. I will review it!"